I first saw Katrin Dreiling's work online, where she regularly posts some of her gorgeous illustrations. I loved her style right away. Then, late last year, I had the chance to meet Katrin at an event in Brisbane, and discovered she's a lovely person, on top of being crazy talented! Katrin has a clear-cut style and creates memorable illustrations. I'm delighted to be able to interview her here on my blog. Read on to find out about her picture book, The World's Worst Pirate, and her creative process, inspirations, and more. Can you tell us a bit about your latest book, and the themes/issues it explore? 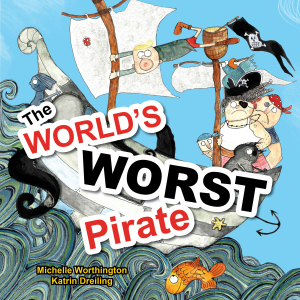 Thank you Kellie for giving me the opportunity to talk a bit about “The World’s Worst Pirate” (written by Michelle Worthington, published by Little Pink Dog Books). It is a pirate story about self-acceptance, accepting others, and cooking; plus also a bit of girl power, friendship, and a giant Kraken. A very colourful and positive little book with quirky illustrations. What was your process in illustrating this book? As usual, I stay with the manuscript for a long while just reading and getting to know the story and characters, sketching just in my mind. When I finally seem to be overflowing with ideas I start sketching on paper, then storyboarding and - if all of this has been approved by publisher and author - I start on the final illustrations. The difficulty with this project for me was to not overload the book with ideas just because I loved working on it in this team so much. I always base my work on ink drawings but then combine with all sorts of media and techniques, such as watercolour, acrylics, paper-collage, digital and printing. I’m especially interested in textures and using techniques/media children are familiar with in the hope they will get inspired and be creative themselves. I just love that our little main character, Will, does not give up on his dream of becoming a chef and that his talent eventually convinces his mum and the crew. It’s a very important message for children to be your best authentic self instead of bending towards everyone else’s expectations. Do you have a favourite children's book (or top three) that you can never get enough of? I love these especially for their quirky illustrations and brilliant story lines. A perfect synergy of story and illustrations. What influences do you think shape your work? I think my work has been heavily influenced by the books I grew up with in Germany. As a child I looked at many Swedish, French, English or other European picture books. But I also enjoyed Polish or Russian fairy tales. Are there any tidbits from the publishing process of this book that you could share with us, with regards to working with the publishers and/or the writer? I just believe this was the best possible first experience for creating a picture book in a team. I don’t think it is that common to have ideas exchanged with not only the publisher but also the author, too, and so this makes the entire project very special. Michelle Worthington was an absolute joy to work with and whenever I had a question in regards to the text she was there for me, just as Peter and Kathy Creamer from Little Pink Dog Books were. I remember that it got quite difficult to illustrate a certain text passage because it changed a lot from inside the boat to outside and so I had to ask Michelle to help me there text-wise. She actually changed the manuscript and came up with an open porthole in the pirate ship so that the reader can view both inside and outside of the boat at the same time. It just makes a big difference when you feel like you can rely on the author with such tricky text demands. Our next book (with exactly the same team) will be called “Johnny’s Beard” and comes out later this year. There will be lots of animal characters, plus changing seasons, and characters helping others. Text-wise, I would really encourage children to discuss the themes of tolerance and following your dreams. As per the illustrations I would encourage them to pay attention to details, such as the background story of Bird and Cat or other little accessories such as peg legs, false teeth or tiny animals. I’m a massive Marvel movies fan, especially Guardians of the Galaxy and just love watching them with my family. We named our dog ‘Loki’ after one of the mischievous characters in The Avengers. Where do you do your work, and do you have any particular rituals in your creative process? I work from home in my tiny, cupboard-like studio and always go for a long walk with my dog to clear the head before I sit down to work. I have always been interested in art, being creative and expressive. But I think my three children brought children’s illustrations to my eyes and heart and I have been hooked ever since. I think picture books are one of the most important and precious childhood experiences since they work on so many different levels. Be yourself through your art and be proud of it. You can follow Katrin online at Twitter (dreiling_katrin), and on Facebook and Instagram (katrinartworks).